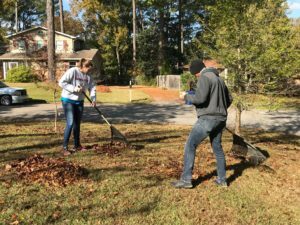 On serve days, every group of volunteers bring their own unique set of strengths and personalities, and Mountain Chapel United Methodist Church was no exception. This group of teenagers and their chaperones were as diligent in duty as they were gentle in spirit. 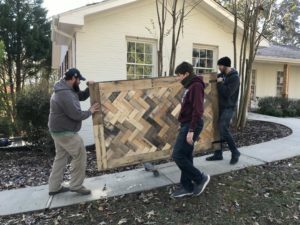 It seems as though teenagers get a bad reputation for being selfish or lazy by many of the older generations, but this group of incredible teens definitely blew this misconception out of the water! The young ladies and gentleman spent their time of service at the up-and-coming Community House bright and early one Saturday morning. Everyone arrived, bundled up in their best winter-gear, and were ready to help make a difference! 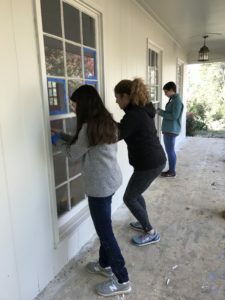 Despite the frigid temperatures, all the volunteers worked outside without complaint doing everything from raking leaves to prepping windows to be painted. Others jobs completed included: throwing away excess sheetrock, sweeping, painting, and bagging the raked leaves. 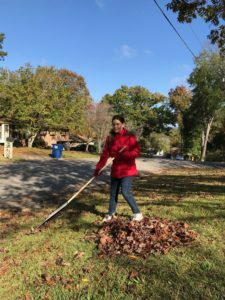 By the end of the day, the crew had collected about twelve-to-fifteen fifty gallon bags of leaves. In moments like this, we can truly appreciate the size of a property! Geez! One behavior that was exciting to watch was how eager the teenagers were to help one another. 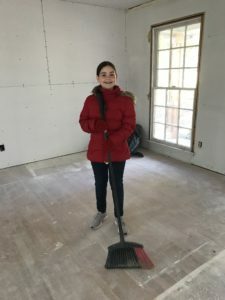 At several points, some of the girls were looking for extra cleaning equipment so they could immediately help with another task once they finished their previous one. Or, if one person became too cold with an outside chore, someone working inside would offer to switch posts for a while, giving the other volunteer an opportunity to warm up by the space heater. Small acts of kindness, such as these, are always a blessing to witness. By the end of the day, the lawn looked impeccable! All of their hard work could have earned the Grace Klein Community House a spot in Better Homes and Gardens! As a token of GKC’s gratitude for everyone’s cheerful spirit and eagerness to help, another volunteer brought fresh hot chocolate and marshmallows for everyone to enjoy. Thanks to another volunteer, there was also a roaring bonfire set up downstairs, and all the staff and volunteers were able to warm up and rest their bones for a little bit before finishing the day’s tasks with a smile. “Have you ever had church outside? Or what about a Bible study? Or even a small group? What about on an absolutely, fabulously gorgeous, Fall morning? What if I told you that I had all three and then some this past Saturday morning at a serve day, no doubt! I am not only blessed to be able to work for Grace Klein Community, but I am also honored to be able to serve alongside them in various projects. 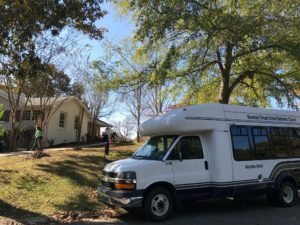 This week it was hosted at our newest community house in Hoover and we were graced with a wonderful group of volunteers from Mountain Chapel United Methodist Church. 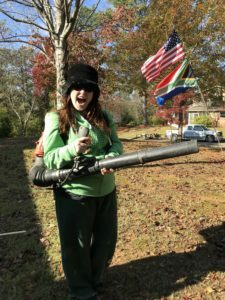 We met bright and early Saturday morning at 8:00am at the house, bundled up in our sweats, toboggans and gloves and ready for the tasks at hand. I had no idea at the time how profoundly the day would impact me. Our initial job was to clear the house of all the sheet rock scraps, place them all in the dumpster and sweep up all the dust and dirt. 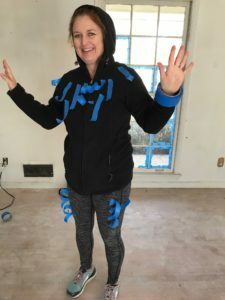 We also moved cabinets, taped windows in preparation for paint and cleared pathways for greater movement in the house while its under renovation. 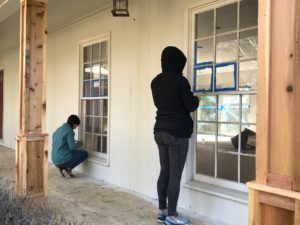 As we were doing these tasks, I silently reflected on that word “renovation.” Sounded a lot like what God has been doing in my life these last three years. To renovate something means to “restore, refurbish, makeover or repair.” Exactly, I thought. I looked around this house, built probably 50 or more years ago, I imagined it was pretty nice at that time. Brand new, sturdy, shiny. But over the years, the rain and the storms came and battered against its outside, the lives lived inside pressed against the walls and scraped off the shiny paint and the countless steps in and out muddied the carpet and left tracks in the floors like well-traveled trails. But now, with a calculated plan and purpose, instead of sitting empty and in disrepair , it has been given new life and a new vision. It amazed me as I looked around and could almost picture the new life soon to be there. 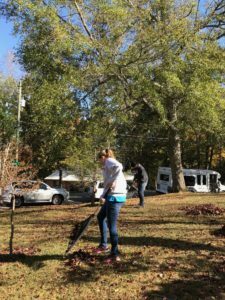 Mid morning we moved outside to the task of raking the lawn and bagging the leaves. I will be completely honest and tell you that these are some of my absolutely least favorite things to do, which is probably why God in His Sovereignty, sent me to do it. He wanted to teach me something in living color. As I was walking the lawn and picking up the larger sticks, I was suddenly reminded of that verse in John 15 that says “He cuts off every branch in me that bears no fruit, while every branch that does bear fruit he prunes so that it will be even more fruitful.” (vs.2) Ah yes, pruning, something I despise as much as I do raking leaves, but much more painful and oh so necessary. I looked at the broken branches and sighed as I thought of the broken relationships that I have lost. Then I looked at the crumpled brown leaves that were once lush and green or vibrantly red and remembered the various things I’ve done “for the Lord” that no longer have a place in my life. Dead works or old habits and traits that no longer fit into the place that He is calling me to. All things that I once thought were so vital to my life, now as lifeless and as useless as these piles of trash, or so I thought. As I was tying off the last bag, I was summoned to the driveway. As I walked over I was instantly delighted by what I saw. All of our volunteers and our staff were sitting by a fire, warming themselves and drinking hot chocolate, while they talked about the day and the purpose of the house. I grabbed myself a cup and sat down with the rest to enjoy the fellowship and the warmth. It was only then that I realized that the sticks and some of the leaves that I had picked up earlier that I thought were so useless, were actually the fuel for the fire. The fire that we were sitting around, sharing, making new friendships and bonding over the beauty of sowing a seed together into this home that will bless other families for generations to come. Beauty from ashes.